Bannock Trail Lodge is the ultimate getaway for your family reunion or corporate retreat! 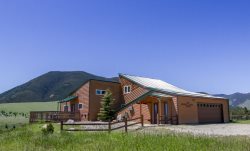 Surrounded by fantastic views of the West Fork Canyon and the Silver Run Elk Refuge, this modern style 4 level lodge boasts 8 bedrooms, 4 baths, outdoor hot tub, pool table, wood burning fireplace and more. With a great set up for large gatherings or multiple families, this lodge features 2 living rooms and 2 kitchens. Great for conferences and retreats, this lodge comes fully equipped with high speed internet and all the modern conveniences your group or family could need. Large decks for grilling and relaxing in the Montana evenings give this lodge the perfect final touches so turn on the bubbles, crank up the grill and escape to Bannock Trail Lodge today! We really appreciate the accommodations that you provided with this location. We were also very appreciative of the late check out. The house was very spacious. There are multiple rooms and areas in the house. The kids loved playing and exploring everywhere. Convenient and quiet location. The views are really amazing from multiple areas of the house. Great setup for multiple families. We were contacted a few days in advance to go over various things, as well as emailed the information. I thought that was very helpful. Highly recommend.